These are just some of the detail contained in the UK government's sectoral analyses prepared in advance of the country's departure from the EU and published ahead of Christmas by the House of Commons Brexit Committee. Instead, it is left largely up to the reader's imagination to guess the potential impact, or otherwise, of Brexit on each area. That was expected after Brexit Secretary David Davis' incredible admission before the House of Commons Brexit committee last month that the government hadn't carried out any formal impact assessments on each sector of the economy. 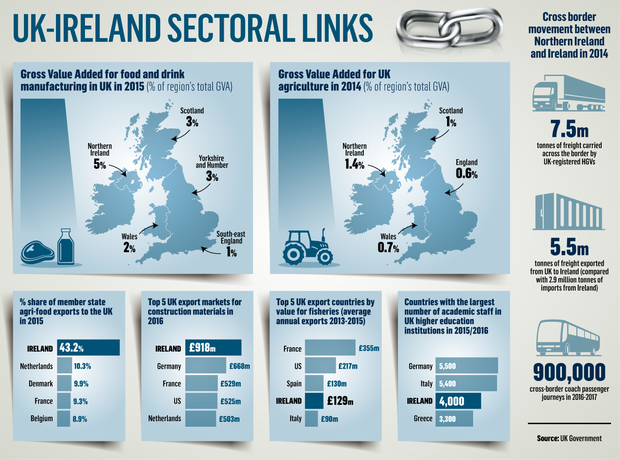 The most staggering is the scale of our agri-food sector's dependence on the UK market. The reports also touch on the importance of Ireland as an export market for the UK's construction sector, topping the table, followed by Germany, France, the US and Netherlands. In 2016, the UK exported £918m worth of construction materials here. "The top five export markets for construction materials in 2016 are the destinations for 49pc of total construction materials exports," the reports state. "Ireland remains the largest market, despite having shrunk from a pre-recession peak of 27pc of total exports in 2007, to 14 pc in 2016."